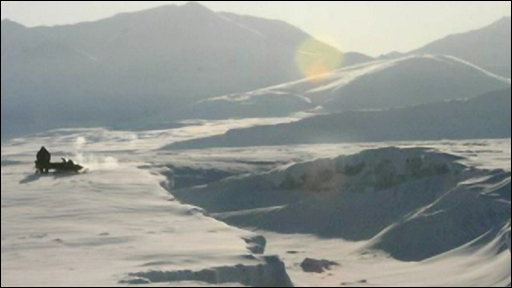 Scientists travelling with the troops found major new fractures during an assessment of the state of giant ice shelves in Canada's far north. 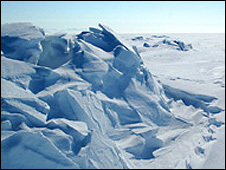 The team found a network of cracks that stretched for more than 10 miles (16km) on Ward Hunt, the area's largest shelf. One of the expedition's scientists, Derek Mueller of Trent University, Ontario, told me: "I was astonished to see these new cracks. "We're seeing very dramatic changes; from the retreat of the glaciers, to the melting of the sea ice. "We had 23% less (sea ice) last year than we've ever had, and what's happening to the ice shelves is part of that picture." When ice shelves break apart, they drift offshore into the ocean as "ice islands", transforming the very geography of the coastline. Last year, I was part of a BBC team that joined Dr Mueller and Dr Copland as they carried out the first research on Ayles Ice Island, an iceberg the size of Manhattan. It has since split into two, each vast chunk of ice now 400 miles (640km) south of its original position. After the record Arctic melting last year, all eyes are now on what happens to the sea ice this summer. Although its maximum extent last winter was slightly greater than the year before, it was still below the long-term average.